President Obama has become the first sitting president to visit Cuba since Calvin Coolidge in 1928. The historic visit symbolizes the first tentative openings between Cuba and the United States since the Cold War. Having an American president in Cuba for the first time in almost nine decades demonstrates the thawing of a half-century of American-Cuban hostility. The possibilities about to emerge for millions of Cubans are reason enough to celebrate. The President’s visit so far has been dominated by symbolism. He began his day at the memorial to the Cuban journalist and poet José Martí. A Cuban military band played “The Star-Spangled Banner” under a Cuban flag as the American president and a Cuban Politburo member appeared together, framed by huge sculptured portraits of revolutionaries Che Guevara and Camilo Cienfuegos in the distance. Elated residents lined narrow streets waiting for a motorcade including the presidential limousine, adorned for the first time with Cuban and American flags, to pass through so they could cheer and take pictures with their cell phones. The apparent rapport between the presidents of the two countries at a news conference was a striking display of warmth. 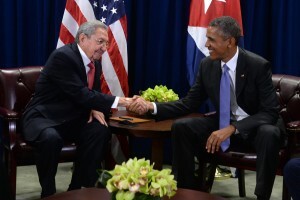 Cuban President Raúl Castro said, “We agree that a long and complex path still lies ahead. What is most important is that we have started taking the first steps to build a new type of relationship, one that has never existed between Cuba and the United States.” Afterwards, the two men joined hands in what appeared to be a cross between a handshake and the raising of a revolutionary fist. Mr. Obama said he expected to see the lifting of the United States’ trade embargo of Cuba. Mr. Castro called that act “the most important obstacle to our economic development and the well-being of the Cuban people.” Representative Charles B. Rangel, who is also visiting the country, has spent decades in Congress working to end the embargo and says he couldn’t be happier with the progress made.